16 - 16 parallel dots (Neer Pulli) Kolam - Start with 16 dots - 16 lines. After finishing the kolam, erase the extra dots left out. Lovely Kolam. It tried it out for Pongal. Gave a spectacular look. 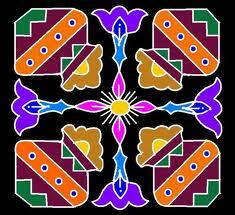 Nice to hear that you have tried this Kolam. Thank you for visiting my site and your comments.